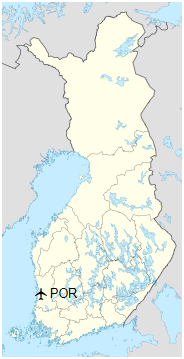 Pori Airport (Finnish: Porin lentoasema) (IATA: POR, ICAO: EFPO) is an airport in Pori, Finland. 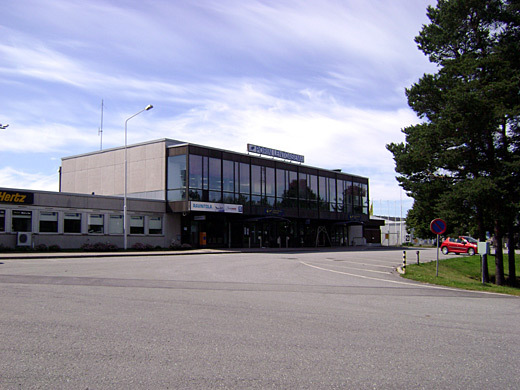 The airport is located 1.4 nautical miles (2.6 km; 1.6 mi) south of the Pori town centre. It has two check-in desks, and a cafeteria service. During 2011 Pori Airport served 54,056 passengers, an increase of 25.2% from previous year. However, in 2014 it was down to 24 983. The airport resides at an elevation of 13 metres (43 ft) above mean sea level. It has two asphalt paved runways: 12/30 measures 2,351 by 60 metres (7,713 ft × 197 ft) and 17/35 is 801 by 30 metres (2,628 ft × 98 ft). The Finnish Aviation Academy is a flight school based at Pori Airport. As is the Satakunta Parachute club «Satakunnan Laskuvarjourheilijat». As of October 2018, there are no regular scheduled services at the airport. Pori Airport was long served by Finnair and co-operated first by Finncomm Airlines and later by Flybe Nordic. However, these flights were ceased on April 9, 2012.Wingo xprs flew to Helsinki during September 2010, but they ceased the flights due the financial problems of the company. Also Air100 flew to Helsinki but ceased the flights in June 2014. Until their bankruptcy in May 2018, Swedish Nextjet flew to Stockholm-Arlanda and Helsinki-Vantaa. Flight training for private pilots (PPL/LAPL-licences) is given by local flight school Porin Lentotilaus Oy.